A hearty welcome to all visiting our website and wishing to learn more about Maxlrain. Maxlrain is a wonderful place to unwind and an ideal destination for an excursion, regardless of whether you just drop into our tavern for a pint, dine in our castle restaurant, embark on a walking or cycling tour or simply attend one the many cultural events staged here. Needless to say, the pride and joy of Maxlrain is our private brewery which forms the centrepiece of the entire setting. All products are backed by the full conviction of our family, brewing what must be the best and most cultivated beers in the whole of Bavaria. Maxlrain is picturesquely situated in the rural district of Rosenheim, almost on the doorstep of the spa town of Bad Aibling, set amidst breath-taking alpine scenery dominated by the awe-inspiring peak of Mount Wendelstein. Arriving from Munich on the A8 motorway, Maxlrain is a couple of minutes’ drive away from the motorway exit “Bad Aibling”. Maxlrain boasts very few houses, its most imposing landmark being the Renaissance Castle, adjacent to which the brewery, castle restaurant and tavern combine to form a unique complex with a great deal to offer in the way of cultural highlights. 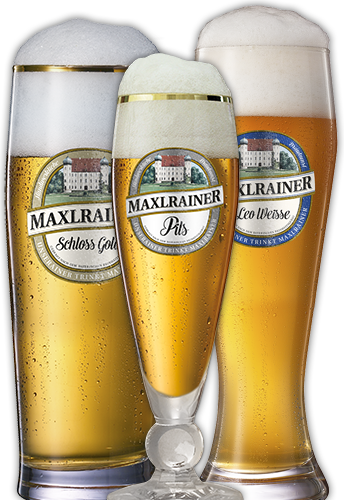 There is evidence of beer having been brewed in Maxlrain since 1636. Up to about 1900 brewing was still being carried out in the castle itself before being transferred to the site we know today which has continued to retain all the charm and magic of a family-run rural brewery. Master Brewer Sepp Kronast jealously guards the process of brewing all the fine speciality beers, meanwhile 15 in number. Year in, year out, the Maxlrain Castle Brewery qualifies for multiple gold awards and has been nominated for the Federal Honorary Award incessantly since 2008. This is the highest distinction for a German brewery. Detailed information on the brewery can be found HERE. For years on end the Maxlrain Tavern has been a popular with locals and travelling visitors alike. A neat rustic ambience enhanced by Bohemian vaults provides a delightful setting for enjoying typical Bavarian delicacies. In summer, the largest beer garden in the rural district of Rosenheim is an inviting, atmospheric spot to relax and while away sunny days or evenings in the shade of chestnut trees or under a cooling sunshade. A large adventure playground serves to complement the whole, making Maxlrain an ideal destination for a family excursion. Regular pre-lunch music sessions are staged to which you can enjoy your morning pint. The Maxlrain Castle Restaurant Schlosswirtschaft is well known throughout the rural district of Rosenheim, noted for its high-class alpine cuisine and international savouries. In its present-day form the building dates back to 1618. The rustic charm of yesteryear has been fully retained in the cosy tavern, function room and spacious banqueting hall. This is what makes the castle restaurant so popular for wedding receptions and special events. The congenial atmosphere of our beer garden dotted with age-old chestnut trees and offset by spectacular views of Mount Wendelstein, Maxlrain’s local peak, is a real summer treat.